Tesla Motors CEO and co-founder Elon Musk is famous for blowing off hydrogen fuel cell vehicles as "bull----," but it looks like he may have stirred a hornet's nest. Spurred in part by the success of Tesla's zero-emissions, battery-operated EVs, oil companies are helping to build out a fueling infrastructure for fuel cell vehicles. That's not necessarily a clear win for the environment, because the primary source of hydrogen for fuel cells is natural gas. However, hydrogen from renewable sources is already inching into the market, and some oil companies -- Royal Dutch Shell being one notable example -- are beginning to transition into lower-carbon business models. Where are all the hydrogen stations? Hydrogen fuel cell vehicles run on electricity, just like Tesla's popular Model S. The difference is that the Model S stores an electrical charge in a battery. Fuel cell vehicles generate electricity through a chemical reaction between hydrogen and oxygen. The only emission is water. Fuel cell EVs have one big advantage over battery EVs: They can be refueled in a few minutes just like a conventional car. The problem is that very few hydrogen fuel stations are available. On the bright side, several interesting collaborations have popped up to fix that problem. Shell is mapping a hydrogen transition. Back in 2015 the company announced big plans for a hydrogen fueling network in Germany, leveraging locations at existing gas stations. In the latest development, Shell is banking on a $16.4 million grant from the California Energy Commission to help fund the construction of seven fuel stations. Shell and Toyota -- manufacturer of the Mirai fuel cell EV -- will chip in the remaining $11.4 million. The eventual goal for California is 100 public fueling stations by 2024. In consideration of the natural gas issue, Shell's interest in the California market is a step in the right direction. The Air Resources Board requires 33 percent renewable hydrogen to be dispensed in any fuel station that it funds. "When driven, the vehicle’s fuel cell converts compressed hydrogen from the fuel tank into electricity that powers the motor. FCEVs produce no emissions from the tailpipe, only water. When renewable electricity is used to make the hydrogen, the vehicle can effectively be driven without generating any carbon emissions." Helping that initiative along, last year Shell created a division devoted to wind energy investments. As cited by Bloomberg, the company's chief financial officer let word out that Shell foresees demand for oil peaking in about five years. "Musk may be inadvertently helping Toyota’s cause. Early on, Big Oil wasn’t convinced cars could make the zero-emission switch in droves. Then Tesla took about 373,000 pre-orders for its Model 3 sedan last year. The oil industry was 'a bit scared' by the feverish reception, said Katsuhiko Hirose, a Toyota project general manager." Despite the environmental issues involving natural gas, the U.S. is forging ahead with plans for the hydrogen economy of the future, as is Japan. Europe is another hotbed of fuel cell activity. Earlier this year, Shell partnered with a dozen other industry stakeholders to form the Hydrogen Council: a new organization with a mission to help guide policymakers toward best practices and encourage an efficient transition to fuel cells. "Efforts to decarbonize the energy system need to pull on four main levers: improving energy efficiency, developing renewable energy sources, switching to low/zero carbon energy carriers, and implementing carbon capture and storage (CCS) as well as utilization (CCU). 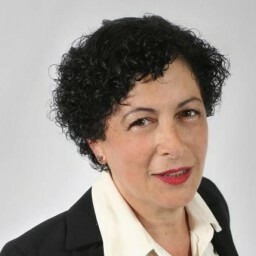 This will radically change energy supply and demand." "I just think that they're extremely silly ... It's just very difficult to make hydrogen and store it and use it in a car," Musk said at the time. "If you, say, took a solar panel and use that ... to just charge a battery pack directly, compared to split water, take hydrogen, dump oxygen, compress hydrogen ... It is about half the efficiency." It looks like hydrogen may get the last laugh after all. 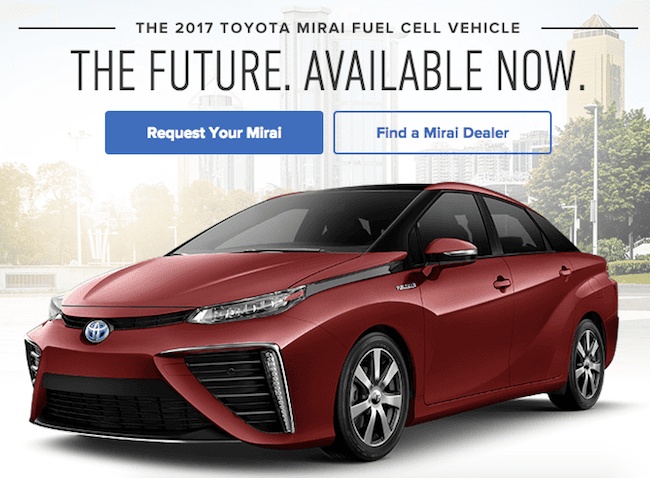 Image (screenshot): 2017 Mirai fuel cell EV via Toyota.